Last night Ray & I played in the County Champs Minor Section. Ray won with a neat mate against Ben Vaughan, and I lost to Toby Hoch. I never felt I got started, but my Silicon Buddy Fritz suggests that things were pretty level to Move 25 ish, when I instituted an unsound Exchange Sacrifice. Tuesday we've got a Harrod Cup match vs Hinckley at the Arms and possibly some casual chess. The new grades have been issued today. From now on, the ECF will be producing grades twice a year with the next ones appearing in January. Draws all round for Heathcote contingent in county champs last night for Sean, Rajan and Graham Booley. Sean had a straight forward draw, he tried to counteract Phil Harlow's usual prep by playing something new, The centre game, but it still calmly went down to opposite coloured bishops and a draw was agreed. Rajan won the exchange against John Robinson, but Johns bishop pair were strong enough to hold out against Rajan's Rook and knight and the draw was agreed. I had a first!! in my game against Mick Tate, draw by mutual consent due to injury/illness, Mick suddenly jumped up from the board and limped out the room with cramp, he thought it might be something worse so an ambulance was called and then cancelled as he felt better, by this time we had agreed to call it a draw. I think I was slightly better and about take a pawn on A5 which would have made for an interesting game. Some shocks in other games as Martin Burrows and Phil Horspool both lost. All games should be available on the LRCA website. Some bad news; Rajan, having moved to Northamptonshire, will not be playing for us next season. We wish him luck and will miss his entertaining games. This will leave the 1st team short on strength so if anyone knows any players 160ish looking to change teams and want to play board 2 or 3 in 2nd division let them know we have a vacancy!! He now shares the lead with Alan Byron on 3.5. They will meet in round 5. We had another good turnout for club night on Tuesday. There will not be one next week, on Tuesday 26th, however, as quite a few of us will be competing in the County Championships at Wigston on 28th July. The following week, Tuesday, August 2nd, we play at home in the Harrod Cup against Hinckley and there may also be the opportunity of some casual games. Our club is always wells represented amongst the competitors, and we have been known to win prizes. The grass arena - the 1991 film based on the autobiography of John Healy - has now appeared on You Tube in 6x15 minute sections. The film details Healy's descent in alcoholism and violence in the parks of London, before he discovers a considerable talent for violence over the chess board. The chess begins in part 4 when he learns to play whilst in prison. Whilst there is not actually very much chess in the book, there is loads in the film. Well worth a look. We are going through a bit of a quiet spell at the moment. On Tuesday, we had a club night with a decent turnout, but there are no actual matches this week. Next week there will definitely be a club night on Tuesday (so come down if you can), and the two Grahams, Sean, and Rajan compete in the Open section of the County Championship on Thursday. There will be a home match in the Harrod Cup against Hinckley at some point before 3rd August. The next match for HA1 will be in the Wylie at home against Braunstone 1. Date to be confirmed. New grades will be out by the end of the month. They should appear on the gradings page on this site automatically - but as soon as i know about them, i will write something here. Another 2 out of 2 for Mike (down to last seconds again) helps us see off a weakened Melton team. thankfully Graham Lee and John Denton were both unavailable for the opposition. This win puts us at the top of the Wylie cup table. On Tuesday, we also had a decent turnout for some friendlies. Next week there are no organised matches and no County Championship activity, so we should have a busy club night. We will not have Haka Dave, however, as he has a date. Dave maulled Dennis Wilkins; i drew with David Reynolds; and Ray swindled a win from Paul Martin, having earlier dropped his queen. 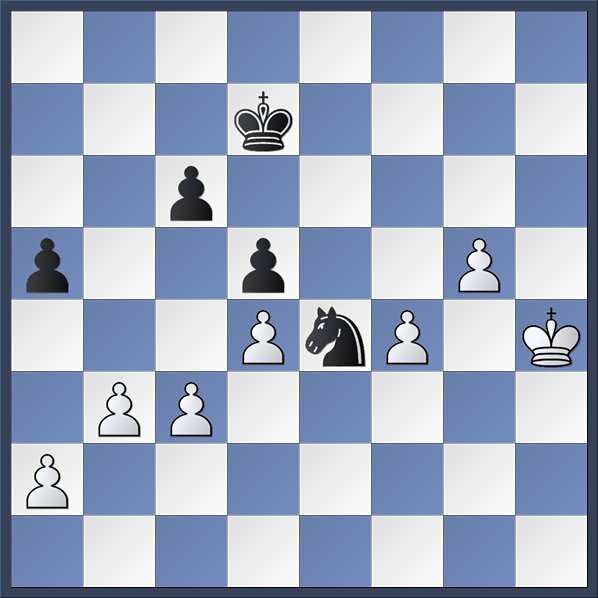 After 35 Nh3+, Fritz gave the better continuation: 36 Kf5 Kc7, 37 g5 Kd6 with white having the better of it. 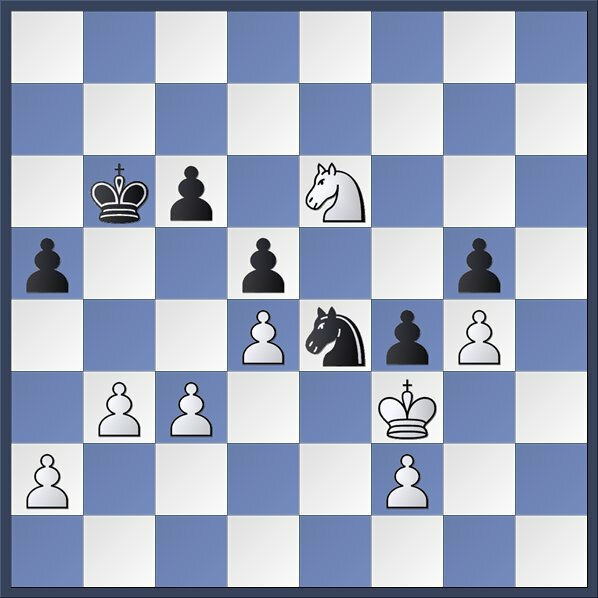 After our games, John Manger appeared and we all watched the Byron Vs Morley game, from board 1 in the Championship section, in what turned out to be a superb display in endgame technique. Next week, back at the Arms, HA1 play in the Wylie, and some beer chess for the rest of us. Owing to an organisational hiccough our team arrived at Syston a player short. 3 W 129 Johnson, Cyril 1 - 0 **DEFAULT** ? Ray reports: I commited all the mistakes that are possible on a chess board and lost badly to Liz Gist, John won against Ben Pourmozafari, and Rob had a great game, but lost in the end after two and a half hours.